Exciting news – Mid-South Spay & Neuter is now Spay Memphis! We have not only changed our name and logo, but have moved to 3787 Summer Avenue. Read the full announcement here. Today is National Lost Dog Awareness Day which was created to give hope to the families still looking for their dogs and..
Join Spay Memphis at Paws for a Cause at the Shops of Saddle Creek on Saturday, April 13 from 10 am – 3 pm. This event is rain or shine! Learn more online here. 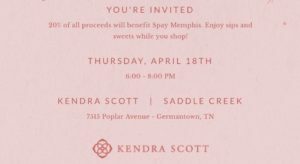 Join Spay Memphis at the Kendra Scott store at Saddle Creek on Thursday, April 18 from 6:00 – 8:00 pm for sips, sweets, and jewels. 20% of all purchases during this time will benefit Spay Memphis. Get your pet microchipped and/or up-to-date on vaccines at Spay Memphis on Sunday, May 19 from 12 – 3 pm. Walk-in only! Must be in line by 3pm to be seen. 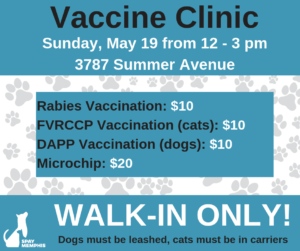 Only the following services will be offered: Rabies vaccine, FVRCCP (cats), DAPP (dogs), and Microchipping. * Cash and all major debit/credit cards will be accepted as payment. 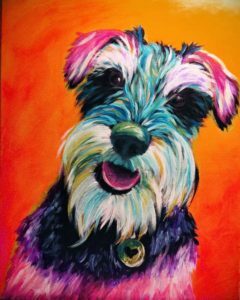 Sign up to Paint Your Pet and support Spay Memphis! Not only do you get to paint your beautiful baby, but you get to help out other fur babies too! Last day to register is May 26th and the last day to submit the photo of your pet your painting is June 2nd. Once registered, email a high quality (not blurry), well lit photo of one pet per painter to sanderlin@pinotspalette.comwith a subject line of June Spay Memphis Project Pet. Sign up here! Read what others are saying about our clinic!